What are IXPs? 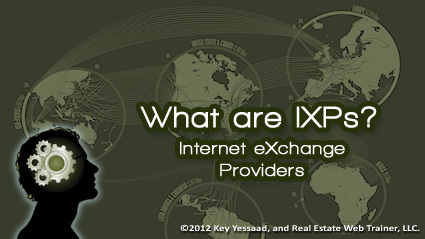 IXP stands for Internet eXchange Point. IXPs are physical internet infrastructure used by Internet Service providers (ISPs) to keep content as close as possible to Web visitors. Ten years ago the internet trafficked about 1.5 Tbps (terabits per second; 1 terabyte equals 1,024 gigabytes); now it has exceeded 75 Tbps – think of it this way: it is the equivalent of downloading all of iTunes music once every second. As the internet continues to be adopted by more and more people, and not just for entertainment but for large scale business services, it is crucial for ISPs to have Servers that keep data as close to possible to Web visitors. These content reservoirs have reduced the total bandwidth in the US from international web visitors from 90% to 40%, which of course reduces latency for visitors from within the US. PS: Did you know that with the advent of Smart Phones and Tablets that AT&T and Verizon are fast becoming some of the largest ISPs in the country?